While cockroaches are a troublesome pest, some of the most common means of repelling them contain harsh chemicals and poisons that are nearly as bad to have around as the bugs themselves. If you want to repel cockroaches through safer, gentler and more organic means, there are a variety of plants & flowers that repel cockroaches. 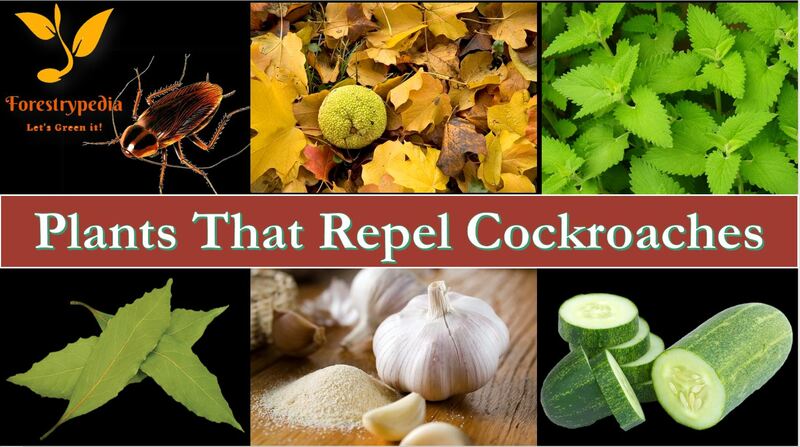 Following are the most popular Plants & Flowers that repel cockroaches. Catnip is not only one of the most effective deterrents against cockroaches in the plant kingdom, but it’s also one of the best roach repellents available across the board. Researchers at Iowa State University determined that the smell of catnip is 100 times as effective in repelling cockroaches as DEET, the active chemical in heavy-duty insect repellents. Catnip, (Nepeta cataria), also called catmint, herb of the mint family (Lamiaceae), noted for its aromatic leaves, which are particularly exciting to cats. Catnip is commonly grown by cat owners for their pets, and the dried leaves are often used as a stuffing for cat playthings. The herb is native to Eurasia and is used as a seasoning and as a medicinal tea for colds and fever in some places. Reconsider using catnip methods if you have a cat – it could drive your cat up the walls. Osage orange, (Maclura pomifera), also called bow wood, thorny tree with large, yellow-green, wrinkled fruit and a milky sap that can produce dermatitis in humans. Whole fruits from Osage orange trees have been recommended as a repellent by placing whole fruits in areas where cockroaches have been sighted. The fruit resembles large citrus fruits in size and shape, except these are solid with bumpy, green surfaces. A concentrated extract of the oils from the Osage orange tree, also called hedgeapple, was painted on walls and later observed as blocking the paths of cockroaches. Sap seeping from them can be irritating upon contact. Evidence supports the use of the tropical herb bay leaf in repelling cockroaches. They also repel pantry insects such as weevils, and they deter ants too. Bay leaf has a mild smell to humans but is abhorrent to cockroaches. It is useful for deterring cockroaches around areas like baseboards, cracks in walls and beneath appliances. Extracts and dried powders from Chrysanthemum cinerariaefolium, also called Dalmatian chrysanthemum, are used to create a pyrethroid compound for controlling cockroaches. This paralyzes cockroaches. The pungent aroma of garlic bulbs is one that repels many insects, and cockroaches are no exception. The most effective form of garlic has the strongest smell: fresh, minced cloves. However, fresh garlic is also a smell that many humans don’t enjoy in their homes, so if you want something milder, sprinkle garlic powder to keep the cockroaches away. Cockroaches dislike the smell of cucumbers. The most effective way to use cucumbers to deter cockroaches is to leave cucumber peelings where cockroaches can smell them since the peelings are juicy and give off more odour than a whole cucumber. Though you may not like the idea of leaving cucumber peelings lying around, try making it a habit to prepare cucumbers on a regular basis so that the smell of cucumbers and peelings in the trash will help discourage the bugs.